Claus Oberhauser teaches History and Didactics of History at the University of Innsbruck and the Pedagogical University of Tyrol, Austria. 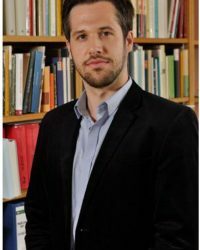 He is the author of Die Verschwörungstheoretische Trias: Barruel – Robison – Starck (2013) as well as the editor of Hinter den Kulissen: Beiträge zur historischen Mythenforschung (2012) and Juden und Geheimnis (2015). Both include chapters on conspiracy theories about Freemasonry and Antisemitism. He is currently working on the project “Diplomacy from the Underground: The Remarkable Career of Alexander (Maurus) Horn (1762–1820)”. Horn adopted a number of roles as a monk, diplomat, secret agentm, and manuscript trader. The project is currently researching all of Maurus (Alexander) Horn’s identities. The aim is to explain the role he played in the power networks of the period and the amount of leeway he enjoyed in diplomatic-political negotiation processes. Horn believed in the power of the Illuminati and was the main supplier of documents for John Robison’s “Proof of a Conspiracy” (1797).